Pawfect Love combines adorable photos of unlikely animal pairs with affectionate quotes to share with the one you love—differences and all! One of the best things about love is enjoying each other's uniqueness. Our animal friends have discovered this already! Delightful photos from the mother-son photography team Warren Photographic humorously communicate the lighter side of your heart's affection in this fun and unique gift book. From a kitten snuggling with a duck to a bunny lounging against a bulldog, these furry pairs remind us that not being exactly the same is part of what makes a relationship great. Quotes from beloved writers such as C. S. Lewis, A. A. Milne, and Donald Miller spotlight topics such as commitment, happiness, and togetherness. This combination of memorable words and sweet photography humorously affirms the idea that sometimes opposites do attract. 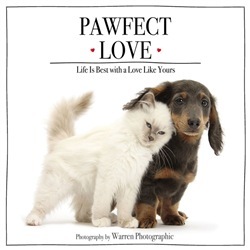 Pawfect Love is a fun, lighthearted way to tell someone special, "I love the unique person you are." So here's to our differences! We wouldn't want it any other way—paws down. Acquista Pawfect Love in Epub: dopo aver letto l’ebook Pawfect Love di Zondervan ti invitiamo a lasciarci una Recensione qui sotto: sarà utile agli utenti che non abbiano ancora letto questo libro e che vogliano avere delle opinioni altrui. L’opinione su di un libro è molto soggettiva e per questo leggere eventuali recensioni negative non ci dovrà frenare dall’acquisto, anzi dovrà spingerci ad acquistare il libro in fretta per poter dire la nostra ed eventualmente smentire quanto commentato da altri, contribuendo ad arricchire più possibile i commenti e dare sempre più spunti di confronto al pubblico online.